Just a quick update on this beautiful girl: At last Wednesday’s re-check with our veterinary ophthalmologist, Dr. Sarah Hoy, we learned — as I had suspected in the previous blog post — that more of Millie’s retina had detached, which is why her loss of vision had become even more noticeable. So the only?option was retinal reattachment surgery, which is done by just’seven veterinary ophthalmologists in North America. It’s a very difficult, time-consuming?procedure (3 to 4 hours under anesthesia), and you can read more about it here. Dr. Hoy had already discussed Millie’s case with the nearest veterinary ophthalmologist who does this procedure, in New York, and she recommended I talk with him further. I spoke with him on Wednesday evening, he spoke with Dr. Hoy again on Thursday, and on Friday afternoon I had another conversation with him. In the end, we decided not to pursue the surgery because Millie was a high-risk candidate … high-risk in this case not to her health, but to the long-term success of the operation. That’s because her eye pressure was now so low that the New York ophthalmologist was concerned about her eye shrinking in time, causing her retina to lose function. It was clear that we wouldn’t put Millie through the procedure if the outcome was this uncertain, so I thanked him for his time, his graciousness and his willingness to help us. Millie, of course, knew nothing of these conversations, and continued to be a happy go-lucky girl despite the total darkness she was now dealing with. I took that photo above this afternoon. 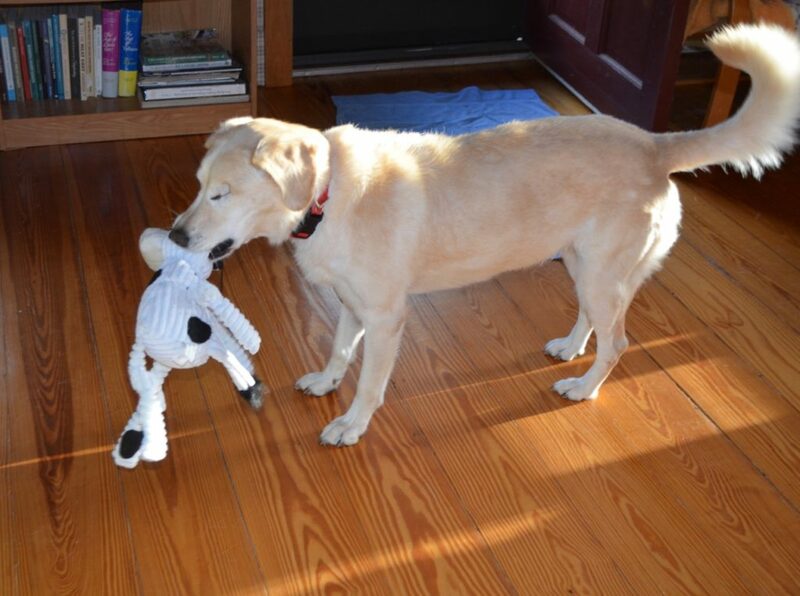 She had just discovered a Holstein cow squeaky toy and was?parading it around the house. You certainly tried to help her, but some things I guess aren’t meant to be. She’s completely happy, as you can tell from previous posts about her. (and she’s such a good looking girl, too.) So as long as she stays healthy and happy, that’s what’s most important. I agree with Barb. It was a wise decision not to do the surgery that may have compromised her well-being. She is a beautiful, happy dog who enjoys her life and isn’t that what we all want for our pets? You made a wise decision based on good advice from good sources. I know y’all do everything possible to help these sweet babies in your charge. Her happiness shows & like all our pets they live in the moment & she has been adjusting & will continue to do so. Thank you for trying. I love her new toy. She’s such a beauty. I think you absolutely made the right decision. There are some dogs that the choice of not treating a condition is the more humane choice. She not in pain and she will probably adjust to her “New” normally dark world with amazing grace. Parading around the house with a “prize”……I think she’s a pretty happy camper. Humankind could learn from her graceful acceptance of life as it comes. That’s disappointing, and a difficult decision, but seems like the right one. Millie looks very happy and she is indeed a beautiful girl. Love that tail!